Efrem Ghebremeskel, Quality Manager of the National Animal and Plant Health Laboratory in Asmara (Eritrea), has been invited to attend a three-week training course at the G. Caporale Institute. Mr Ghebremeskel's study visit, arranged as part of an OIE brucellosis twinning programme between the G. Caporale Institute and the Eritrean National Veterinary Laboratory, will mainly focus on subjects relating to quality and ISO 17025 accreditation of laboratories. For the first time, in accordance with directives issued by the Institute's management, it has been decided to increase the involvement of the diagnostic centres in international cooperation activities. 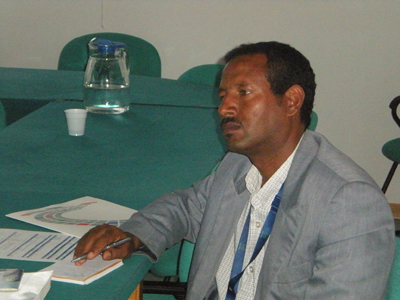 Mr Ghebremeskel will consequently spend his first week's training at the Lanciano centre, the second week at the Pescara centre, and the third and last week at the Institute's headquarters, where he will spend most of his time in the Serology and Incoming Materials and Testing departments.